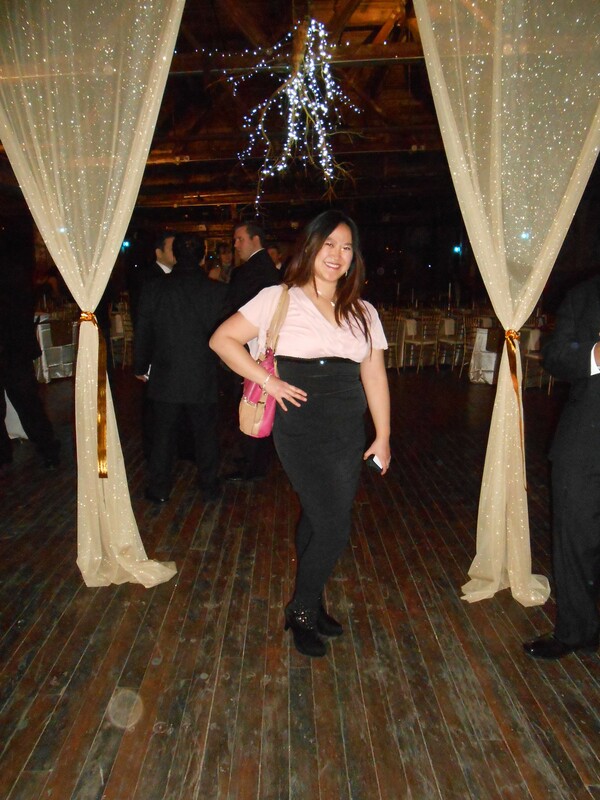 This year’s Yelp Holiday Cruise aboard the Hornblower Infinity was off the hook amazing! Upon entering, my group of friends and I headed downstairs to the first floor, where all the savory food vendors were. After a bit of noshing on yummy savory bites, I headed up to the 2nd level for some sweet treats. There was also CandyTwisted Balloons, where they make balloon hats of your choice… They were gorgeous! On the third floor, where there was an oxygen bar, massage area, painting and a magician. They presented us with a scallop on top of a tortilla chip, which was delicious. I really enjoyed the pan seared scallop and the flavorful pesto sauce on top. This pulled pork taco was quite large and chock full of wonderful tasting seasoning! The meat was juicy, tender and so yummy! I am a chocolate chip cookie girl (which I also tried of course), but one bite of the red velvet cake cookie and I was hooked… It was perfectly soft, had a mix of red velvet and white cream, just the right amount of sweetness and the definition of delicious. The chocolate chip cookie was also mouthwatering good. Cute bubble tea business. The folks making and serving the bubble tea were friendly and bubbly! I couldn’t decide between the regular black tea or the green jasmine tea so they let me try both! They were quite tasty, especially the jasmine tea. I liked the bit of cream they put on top and the tapioca balls were exactly the right texture and size. This booth had both savory and sweet… Gorgonzola gnocchi with greens which were great and for dessert, I chose the chocolate and nutella which was absolutely delectable: Very rich, creamy, chocolate-y smooth and decadent! Perfectly adorable mini donuts of quite a few different flavors. Each one moist and delightful, with sweet icing! Pictured below: Passionfruit and Chocolate. One vendor I didn’t really care for was Chickpea, though I loved their beautiful, colorful, unique and creative presentation of flowers, along with the meats. Beyond that, I thought the naan, chicken and falafel were quite bland and dry. Another that didn’t meet my expectations was Coppelia’s chicken fried rice, especially since I love the restaurant Coppelia. It might have benefited from more seasoning and fresh ingredients. The dance floor was super fun, with great songs and lots of characters, such as Elmo, Unicorns, dinosaurs, entertainers in glittery bedazzled costumes, dancers in white with masks and so on. The boat docked around 9pm, but the DJ and Hornblower Cruises staff stuck around for an extra hour so we could continue having a blast and dance the night away! Flying from CA –> NYC on the Red Eye with a stopover in Atlanta, arriving back on the East Coast afternoon of New Year’s Eve and realizing that my luggage was not at JFK. Apparently it was still in Atlanta! Thankfully, it wasn’t a big issue because I had all my necessary items (including my NYE dress) in my carry on. After ensuring that I would get my delayed luggage delivered to my apartment, I headed home for some much needed rest before going out for New Year’s Eve celebrations. So, what did I wear? Hot pink & silver glitter, an Enfocus Studio dress with filmy light pink V-neck top with black skirt bottom & sparkly black sequined middle, paired with black high heel boots that have silver sparkles. On the way to the venue, I ran into a friend who was going to the same party, which was great timing (also because he didn’t see me fall on the little pothole in the concrete). 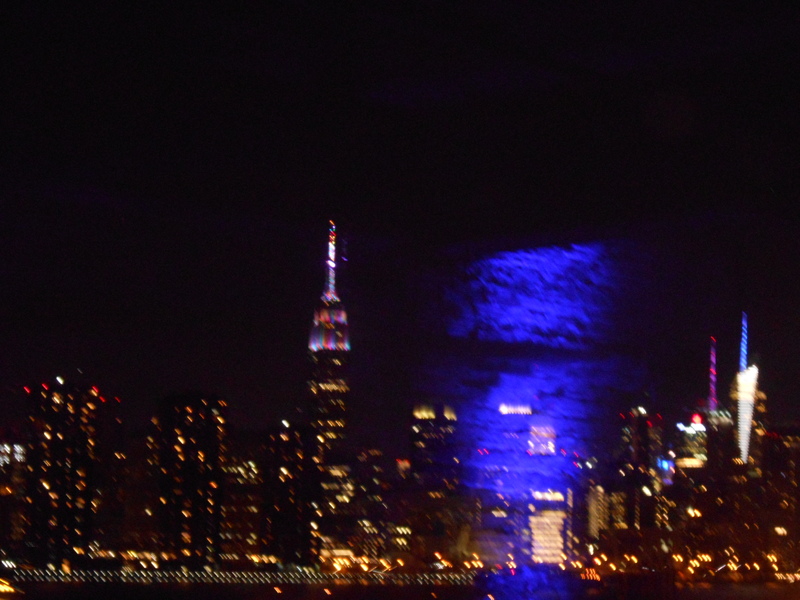 The venue was beautiful- Wood floors, high ceilings, glittering golden drapes, strung up blue twinkling lights, a stage with large projector and a gorgeous view of the beautiful New York City skyline, with the Empire State Building resplendent in flashing colors, front & center. As soon as we walked in, there were waiters with appetizers on trays. My favorite was the chicken filo cups- The chicken was shredded and had a hearty flavor, while the filo cups were flaky and wonderfully crispy at the same time. There was also smoked salmon stuffed cornbread. The cornbread was perfectly soft and buttery, with a slight flavor of salmon. I liked that the flavor of the salmon was not overpowering. Last, there were tomato basil mozzarella cheese balls. It was light, juicy and tasty. 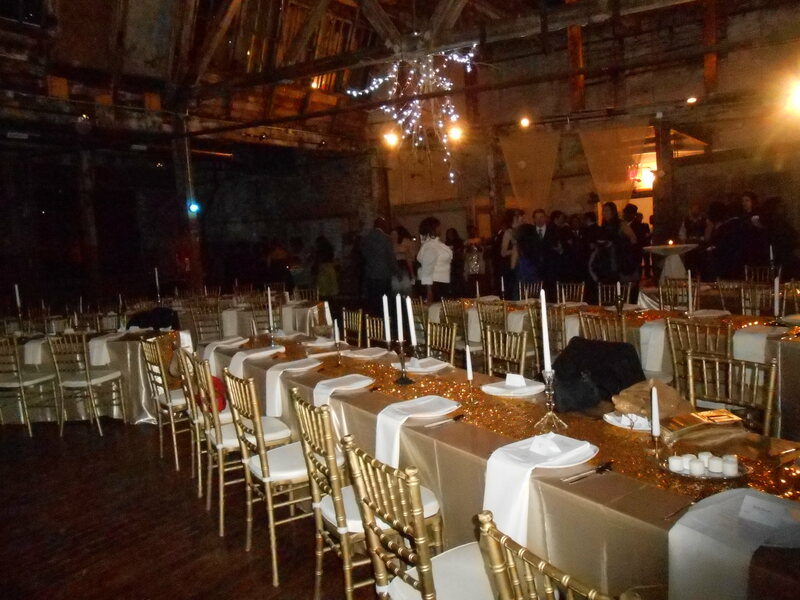 Then there were long tables beautifully arranged for a sit down dinner, with gold glitter down the middle and candles. For dinner, we had the choice of tomato basil soup or salad. I had the soup, which was not warm and tasted mediocre in my opinion. The entree more than made up for it though. 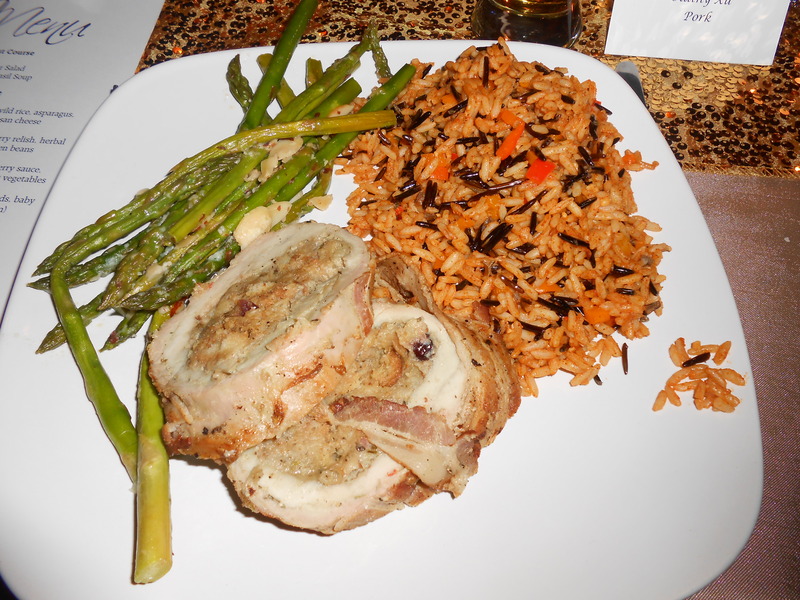 It was stuffed pork tenderloin with a side of wild rice and asparagus with sliced almonds and Parmesan cheese. I really enjoyed the stuffed pork- It was wrapped with bacon, and so deliciously tender and full of great flavor. The wild rice was also quite good, with the right consistency and flavor. The asparagus were cooked well and the almonds and parmesan combined together was a yummy touch. 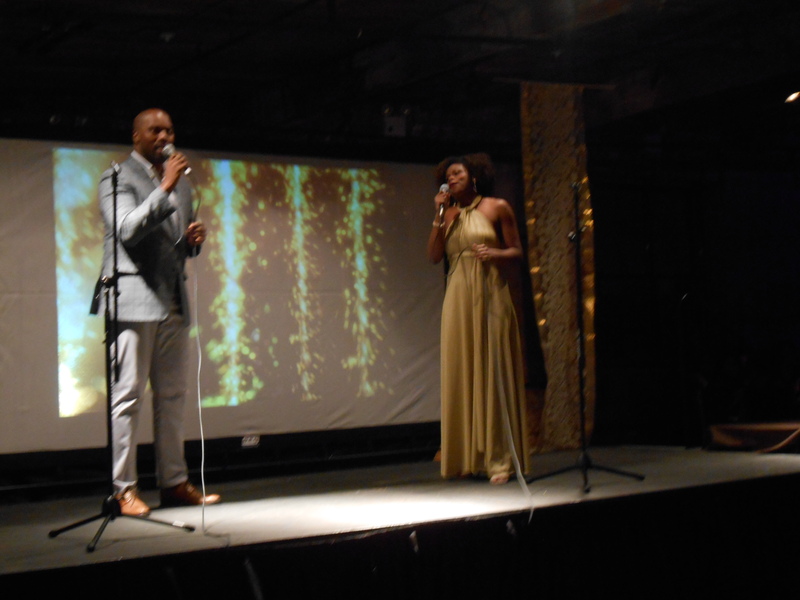 Then, we had some live entertainment and got to see some amazing singers and dancers perform. I enjoyed the heartfelt performances and the last song sung was “Twist & Shout” to get us all up and dancing. It worked. We danced for the next few hours with a live feed of the Times Square celebrations in the background. 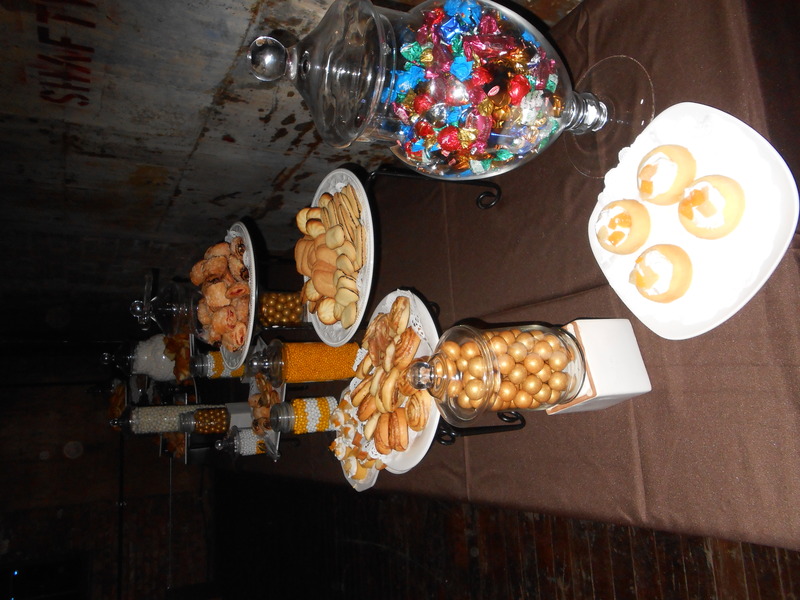 We took a break from dancing to raid the dessert/candy buffet, which had various pastries, yellow cake with cream and fruit, cookies, chocolates, marshmallows, chocolate + yogurt covered pretzels, white covered peanuts, golden gumballs and more! Before we knew it, it was the countdown to midnight! 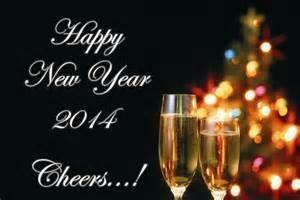 Champagne toast, shouting, hugs, kisses and love. I had such a wonderful time ringing in the new year dancing up a storm in the company of some great friends! And I even got a ride home. How I ask for a better New Year’s Eve?